“Would you like some homegrown tomatoes?”Last Friday I was gifted with a lovely bag of bright scarlet jewels. They were so ripe and ready that at least one couldn’t make it past my lips on its way to a recipe. The second gift was that of a cool weather weekend which now, only 7 days later seems a distant memory. But cool tempatures allow us to fire up the oven which isn’t possible when we’re topping 105 degrees fahrenheit. And it allowed me to test out one of David Lebovitz’s fabulous tomato recipes. First the low down on tomatoes. They are part of the nightshade family which also includes eggplant and chili peppers. Food history tells us that they are a gift from Mexico originally grown by the Aztecs and then transferred the world over by the Spaniards. They are considered a fruit which you’ll quickly concur with once we get to the cooking and like many fruits are dense with vitamins and low in calories. Of particular intensity are vitamins A and C and a phytonutrient unique to tomatoes called lycopene. Red tomato varieties are especially concentrated in this antioxidant and it is said to intensify when cooked. Studies have shown that lycopene may assist in numerous health benefits from skin cancer protection to reduced osteoporosis risk in post menopausal women. It’s a good thing that my son aren’t likely to face post menopausal osteoporosis risk because two of the three have a terrible time warming up to tomatoes. And unfortunately, the youngest who does enjoy them, did not jump at the opportunity of this recipe. This is incredibly simple and so worthwhile that I can’t believe that I haven’t been doing it for years. Roast the tomatoes. I sliced them in half, covered them with a handful of chopped garden herbs including rosemary, thyme, basil and parsley. I also slivered a few garlic cloves and mixed them in. Drizzled with 2 Tbs olive oil and seasoned with sea salt and freshly ground black pepper, place them in a 325 degree oven for a couple of hours. Because I was firing up the oven, I threw in other vegetables in on separate racks. I left them in my oven for a bit too long but truly it doesn’t take away from the amazing fragrance or taste. The possibilities are endless. This morning, I slathered these on a savory waffle and the same can be done on crusty bread with a sprinkling of feta. Tossed in pasta, arranged on a sandwich or scrambled in eggs, these flavorful gems easily find purpose in the kitchen. Now thank God for the persons with the skills to grow them. To those of you in the UK, Happy Jubilee. I’m high jacking your blog! All bloggers check out the Queens Diamond Jubilee celebrations in the UK on your TV, top stuff!! wow! Those look amazing! Can’t wait to try this recipe out once I start getting some tomatoes in my box! You must. I was suprised that they were ready in her garden so early as we don’t get them in our CSA until later. 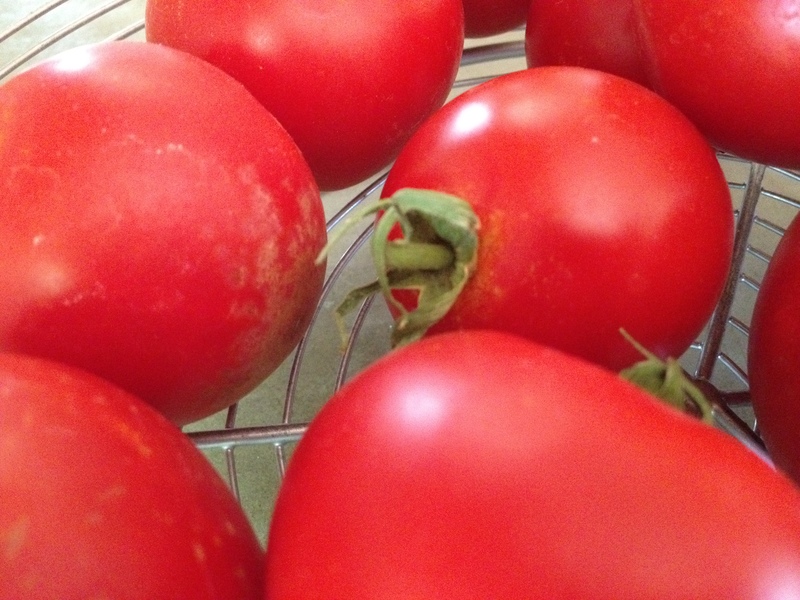 Mmm… I LOVE tomato season! it’s the most wonderful time of the year. 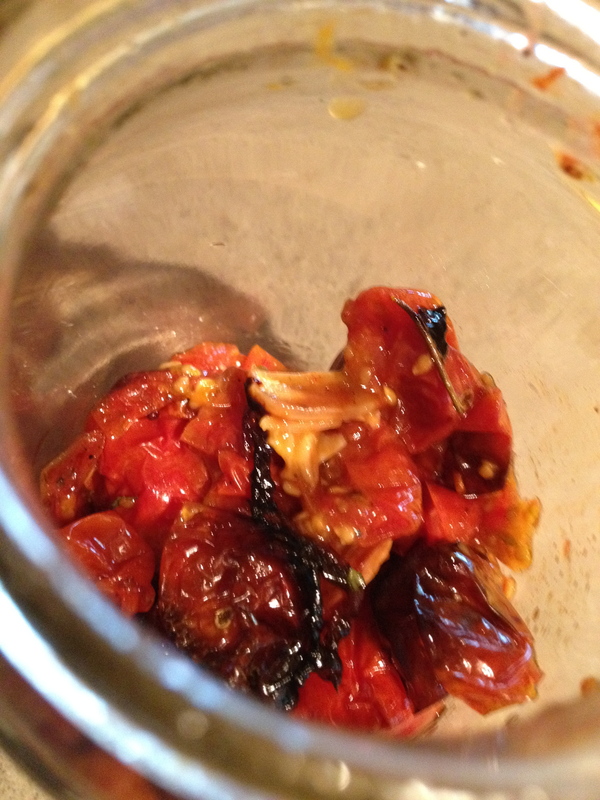 I just made tomato confit last night with basil and onions (looks similar to yours, but more olive oil). I was so excited to see the first tomatoes in our CSA box this week! My CSA doesn’t have any yet but I’m excited to get them when I do. 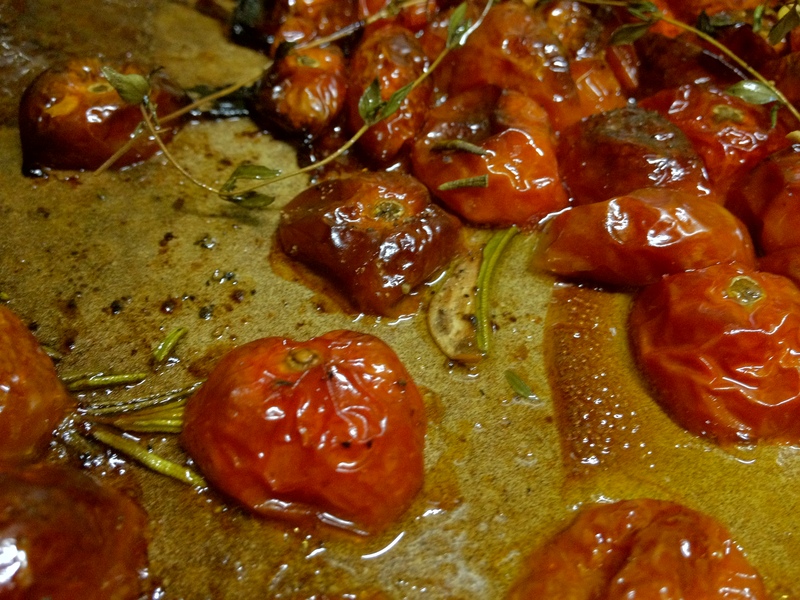 I oven roast tomatoes ALL the time! Our favorites ones are the sweet grape tomatoes…just slice in half, lay out cut side up on a broiler pan, sprinkle liberally with Kosher salt and place in a 225 degree oven until they shrink and concentrate their flavors (a few hours or so). The house smells heavenly and we can then eat them like candy! I store them in containers in the fridge and use them in salads, on pizza, in sandwiches, in omelettes and more. They are similar to sun-dried tomatoes in texture. I’ve even dropped them in olive oil to make roasted tomato oil. Yum! If I don’t let them go as far as the sun-dried texture, then they are fantastic chopped up as a quick sauce for pasta or slathered on grilled bread. Oh, tomatoes! Can’t wait to harvest the ones in the garden! Yes, I love those sweet grape tomatoes. You’ve done them at a much lower temperature than I did and perhaps should have. Delicious. Every vegetable benefits from roasting, IMHO. Mmmm, caramelization. These look wonderful. Although we typically eat TONS of tomates I have never roasted them. I must do so this season! Try it. I know you won’t be disappointed. 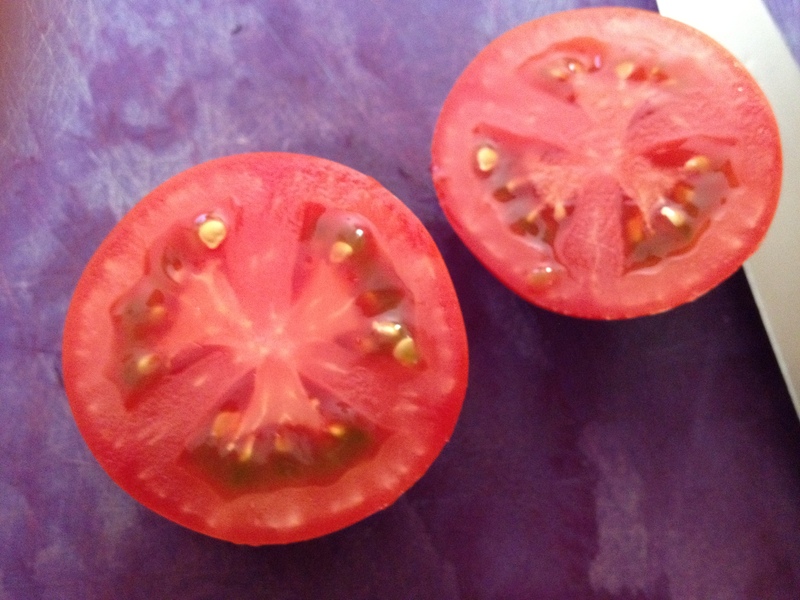 Delicious…can’t wait for my first ripe tomatoes (probably another six weeks, at least). Like you, though, ripe tomato season is almost always too-hot-for-ovens-season here, so I forget how yummy roasted tomatoes are. I’ve heard that roasting and freezing is a good way to save a bountiful harvest. Maybe this year I’ll get one or two cool nights to give it a try. Thanks, Tammy! I have canned tomatoes before and I think I really prefer this as a preservation method. You have made me soooo hungry for them. I will try this with my harvest when it finally comes, if the hail doesn’t get it this year. Yay, it’s the beginning of tomato season! We just picked two huge tomatoes from our garden. They are baking right now with spaghetti squash, julienned zucchini and fresh herbs from the garden. Your roasted tomatoes would be fantastic on homemade pizza! Can’t wait to try your recipe! I love tomatoes & I too only have 1 of 3 that like tomatoes. I am blessed to have a sister in law that can grow them well. We eat them like apples! Yes, it’s hard to get some of them into the pan for sure. I am kind of like the 2 of your boys, not a good tomato eater. But, my hubby is and I try to grow them now and then. Thank you for sharing the roasting recipe! You always bless me and help me in the kitchen! It’s really easy Debbie and I think you might like them. Yum!! I’ll have to try that! We don’t get our tomsties til August. It there’s always lots then. Of course store bought the rest of the year. Yes, so this is a great way to save them when you do have a lot. I love tomatoes . . . one of my favorite ways to use them is Tomato Basil Pie. I did make a tomato pie Nancy but that is for a future post. Now I can hardly wait for our tomatoes to grow. We have about a dozen plants in our little green house and they are my favorite summer treats. One of my favorite also. Looking forward to some photos of yours. I am a tomato devotee and so are my children: I love this simple recipe which shows them off to their advantage 🙂 Favourite tom recipes: the way the Greeks stuff them with mint, rice and feta…my tummy rumbles at the very thought….and something I had just yesterday billed as a vege burger: a bap; a slice of huge steak tomato; a round generous segment of aubergine; all topped with a round piece of breaded goats cheese. It was just divine! Mmmmmmm. That does sound really good. I can’t tell you how the very look of it got me all salivating. This is a winner and I’m so doing it. Feta and crusty bread sounds really yummy with this. By the way, even I think I will never really grow my own tomatoes. Because I know for sure that if my garden gives me the best looking tomatoes, I’ll while away in photography and never eat them. That’s funny. I wish my photos turned out as lovely as yours. I make my own pesto and use it to stuff hollowed out cherry tomatoes. Great tasty and easy dish to take to a party. Yes, that is one of my go-to dishes for a party. OH Yum! What a wonderful history and information. I also love roasting tomatos and have not for a while. It is about 4:30 am and mine are roasting right now because you made me so hungary and I will have them with spinach and scrambeled eggs. Thanks for waking us up to this good aroma. It is cool, 51 degrees in the N.W. and a long ways from tomatos in the garden but the markets are bursting with Florida and California toms. oooh I could do with a cool 51 and oven aroma right now. It will be August before we get tomatoes. Lucky You! I do have a favorite. I will send it to you. Yummy! We bought a gorgeous bunch of tomatoes at the farmers market this weekend, and ate half of them in a salad. I will try your recipe for roasting them tonight! Yummy yummu yummy! It is a very versatile dish! I grow my own cherry tomatoes this year! Yeah! Show us a picture! I love tomatoes. Homegrown tomatoes are my favorite food. I like to slice and eat them, sometimes with salt, sometimes without. I liked tomatoes sliced between two slices of good bread. 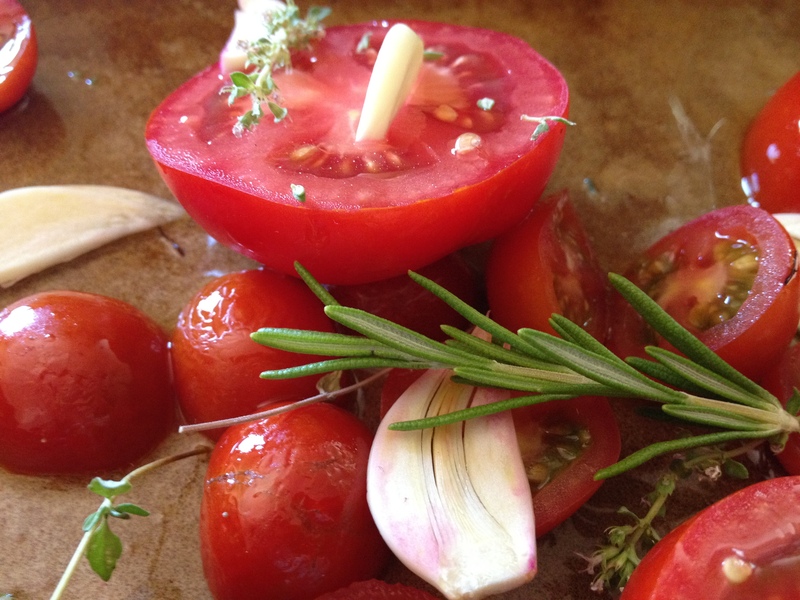 I like to roast tomatoes with herbs and olive oil, like you described. I like to slice the little cherry or grape tomatoes, toss them with red onions and feta cheese and a bit of balsamic vinegar. I like sundried tomatoes on pizza. I like fried green tomatoes, with a crusty coating of buttermilk and cornmeal and a dash of Louisiana Hot Sauce. I like tomatoes stewed with okra. I like tomatoes simmered forever with oregano and served over pasta. In the winter, I like to open a jar of canned tomatoes and make a soup or stew. I have 28 tomato plants (heirloom varieties) growing in my backyard. My parents have nearly a hundred plants this year (the seeds were prolific). Mine are just beginning to ripen. If you’ve never eaten a homegrown tomato, you’re really missing out. Those red things you buy at the grocery store or get on a salad bar taste nothing like real tomatoes. Well, my original comment was that it’s a good thing I don’t need to do it at work – because I can’t. Those photos! How delicious. My mother and more recently my brother grow tomatoes that are absolutely amazing. And yes, definitely thankful to those who have the special ability to help the earth grow! Mmmmm and they taste so good. Liebowitz is my go-to guy. He always has amazing photos too. It’s too hot here now but I am definitely going to have a fall garden. That is so very nice of you. Thank you! I grow them! Now I want to roast them! I have 14 plants just starting out, some cherry, some roma’s for sauce, a yellow one, a purple one, etc. This is just my second year growing them, and I enjoy checking their progress day by day… Tomato and herbs are just the best. Mnnnnmmmn. Good to see you Sherry. I was out at your blog earlier today but didn’t see activity. The good news is that you’re busy with the tomatoes! Yes, I am feeling too busy and overwhelmed to blog much these days! How lucky are you?! Those are gorgeous tomatoes! They are gorgeous and I got some more this week. Mine too and this recipe really is great! Your photos and cooking ideas always have me drooling and looking forward to your next post. Thank you! Thank you Rick. Your photos always have me looking forward to my next trip! Wish I had your talent.